Guided contemplative walk over 2 days as part of Pilgrim Paths Week, 2019. Information, 0861735134 or email, davidross316@gmail.com. St Finbarr’s Pilgrim Path, Co Cork. Guided contemplative walk over 2 days. Information, 0861735134 or email davidross316@gmail.com. Guided walk of St Finbarr’s Pilgrim Path from Drimleague to Kealkill. 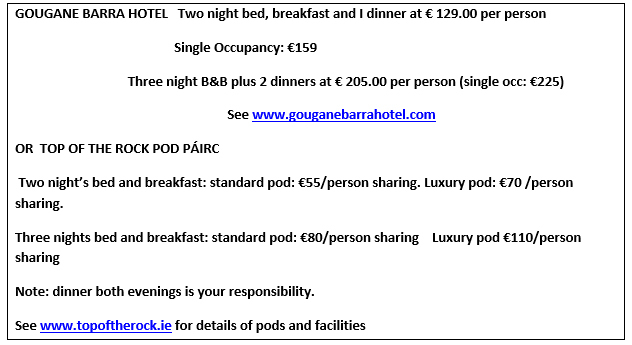 Inclusive accommodation package available. Support car for those not wishing to complete the full walk. Transport. Buses will be provided for those participating. For further information David and Elizabeth Ross, at 00353 28 31547 or email: david@topoftherock.ie. Wednesday 21st September. At 9am depart from the Top of the Rock, Drimoleague heading for Castledonovan, Mullaghmesha and the Mealagh Valley. Lunch will be served in the Mealagh Valley community hall. Arrival in Kealkil having completed the first 12.5 miles of the walk at approx. 5.30pm where a bus will convey us back to Drimoleague for around 6.30pm. Thursday 22nd September. 9am start from Carriganass Castle in Kealkil for the 9 mile walk over the mountain to Gougane Barra. An alternative will be available for those who wish to take a less strenuous walk into Gougane by road. Arrival in Gougane at approx. 4pm with a short time of reflection. COST: Lunch and bus costs €8 and €6 respectively each day. This year we are requesting an extra €4 each day to extend a gratuity to extra guides who will lead us. For updates please keep an eye on the Pilgrim Paths Facebook Page. Some pictures of this event are now available on the Pilgrim Paths Facebook Page. Saturday 13th August. At 9am depart from the Top of the Rock, Drimoleague heading for Castledonovan, Mullaghmesha and the Mealagh Valley. Sunday 14th August. 9am start from Carriganass Castle in Kealkil for the 9 mile walk over the mountain to Gougane Barra. An alternative will be available for those who wish to take a less strenuous walk into Gougane by road. Arrival in Gougane at approx. 4pm with a short time of reflection. In West Cork and South Kerry the practise of walking pilgrim paths to St Finbarr’s hermitage in Gougane Barra has been in place for many centuries. 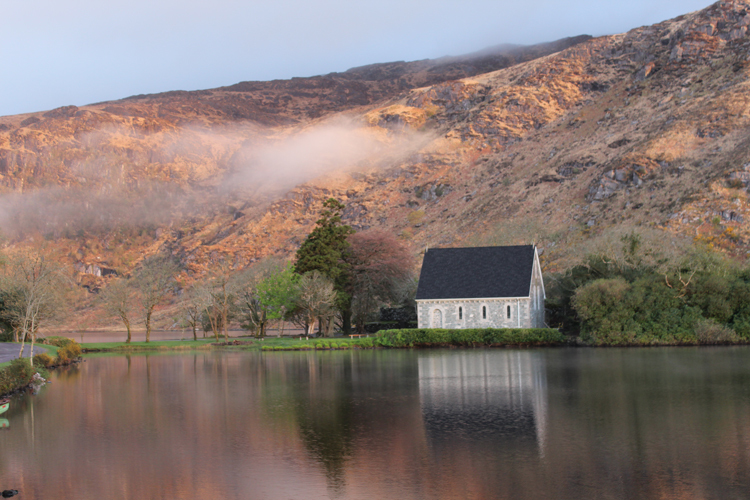 In one such place, Drimoleague, local tradition recalls that St Finbarr arrived at the Top of the Rock in the sixth century and admonished the people to return to Christ, after which he made his way to Gougane Barra. The practise of walking this ancient route has been revived since 2008 and groups as large as fifty and as small as three or four are regularly found walking the 22 mile (35km) route. The route itself has been opened up to the public with the goodwill of landowners along the route, who maintain the walks under the Walks Scheme. Leaving aside the spiritual benefits for a moment, this walk is a truly magnificient journey which goes “up and over” three mountain systems and four valleys, namely the Ilen, Mealagh, Ouvane and Lee valley basins. There are spectacular views over Bantry Bay and stretches of the West Cork coastline. A rich archaeological landscape combined with interesting folklore and the characters one might meet along the way make this an experience that draws people back again and again. But it is the spiritual aspect that attracts many people; the questions raised as you walk: “What motivated Finbarr to bring the good news of Christ to these places? What message did he bring that eclipsed the prevailing darkness which he challenged? And why is there an unusual sense of peace and restfulness in the beautiful island where he held retreat?” The contemplation, the seeking and the finding, the camarderie of other “pilgrims” and the pains and aches at day’s end…all these make St Finbarr’s Pilgrim Way a special experience to be anticipated and experienced to the full. 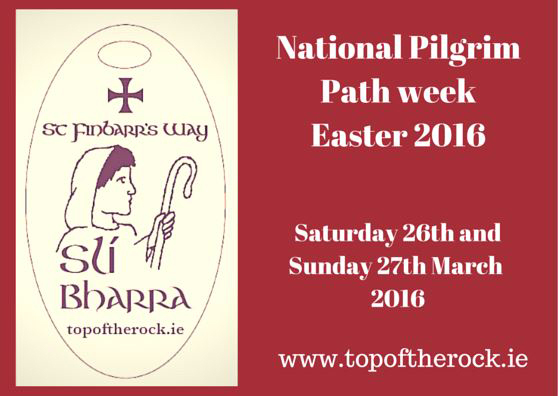 – Good Friday 25th March : 8pm onwards Complimentary light supper at the Top of the Rock Pod Páirc & Walking Centre with time to meet, prepare and orientate to the Pilgrim Walk. A short reflection will be given on the challenge ahead. – Saturday 26th March : 9am Depart from the Top of the Rock, heading for Castledonovan, Mullaghmesha and the Mealagh Valley. (See map https://mapsengine.google.com/map/edit?mid=z_jl1YteN8cU.krcwY-WGSh2Q ) 2pm Lunch. 5pm Arrival in Kealkil having completed the first 19km of the walk. – Sunday 27th March: Bus transfers from Gougane and Drimoleague will enable a 10am start from Carriganass Castle in Kealkil for the 16km walk over the mountain to Gougane Barra. Sandwich lunch at a stop near Lackavaun before the steep ascent. A bus will be available for those who wish to take a less strenuous route to walk into Gougane by road. Arrival in Gougane at approx. 4pm with a short time of reflection and a prayer. The Gougane Barra hotel will host tea and sandwiches for the walkers. 1. Cost of walk: €40/person. This includes lunches both days, bus transfers and cost of guides.